I had watched Ra.One when it had come out in late October, 2011, and had for some inexplicable reason written a review of it too. Yes, I am fascinated with bad movies. **SPOILER ALERT** In case you haven't watched this movie, DON'T. This review may make it seem better than it is. Back in the 70s, in bollywood, long before six packs, chiseled stars, vfx, sync sound and bikini babes flaunting ample cleavage had become common, there existed the concept of plots, around which movies were made. There were bad plots then, no doubt, but nevertheless, their presence was felt. Since then however, the standards have become poorer and poorer, until now, that is. Ra.One, the 150 crore, revolutionary (as claimed by the makers) film has no plot/story whatsoever. The 156 minute journey to insanity starts off with an extended fantasy sequence, that has little or no business being in the movie, but reminds the viewer of 4 well-known facts, viz. (1) srk has abs (2) priyanka chopra is a well endowed women (3) sanjay dutt has bad teeth; and most importantly (4) bollywood isn't mature enough to handle special effects. The film has no story whatsoever, is G.One a super hero? A robot? Or a BODYGUARD? It seems as if there was no bound script, and the directors (apparently Karan johar, tarun mansukhani and SRK himself had directed portions of the film) were improvising all along. There's a kid who looks a lot like shirish kunder, calls himself LUCIFER, and shares a strange relationship with his mother (they have condom jokes in a kids film, and a birthday party where exotic dancers outnumber the guests). There's a video game where there are only 3 levels (seriously!?) And one has to be an olympic level gymnast/martial artist in order to play. There's a superhero/robot whose motive and powers are unknown. But what's more notable is the fact how the vfx element seems forced...the fantasy sequence was entirely unnecessary and did not contribute to the storyline, there are scenes where g1 (SRK, for the uninitiated) and ra1 (arjun rampal, if you really give a sh*t) are throwing cars at each other without any goddamn reason, and so on. Ra.One seems like a movie where SRK thinks the movie's USPs are his presence, akon, the graphics, and its terminator-esque plot, but while salman khan can pull movies off by doing precious little, srk can't. Kareena Kapoor looks good and she plays the stereotyped kareena kapoor character she plays in all her movies. Arjun rampal looks thin and does precious little. The kid in question, armaan verma, is irritating and should seriously get a hair cut else he risks being cast as a girl in the future. Srk reprises his My Name Is Khan role, with little variation, (he punches, kicks and flies this time, and has blue eyes) and his performance doesn't merit a comment. But I wouldn't be surprised if he ends up with the filmfare award. The viewers deserve better and srk too. 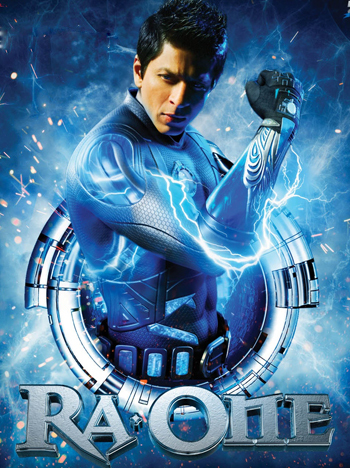 I hope Ra.One doesn't get a sequel. P.S: It's 2015 now. No sequels have been announced to Ra. One (good). Haven't caught the irritating child actor in any other movie since then (better), but Anubhav Sinha, the director of this masterpiece says he has a few movies in the pipeline (damn).